Though a versatile hunter, the sweet-natured Field Spaniel comes home to a new family just as often for their merry companionship as for their flushing skills. They are devoted to their families and go through days with a cooperative, gung-ho spirit. Field Spaniels are mid-sized with a body shape that is slightly longer than it is tall. They are brimming with energy, and are sensitive by nature. The breed requires gentle training that takes their delicate personalities into account, and they can't be left alone—Field Spaniels develop anxiety disorders if they spend too much time apart from their beloved people. Field Spaniels are also simply called Fields. Coat – Field Spaniels have a glossy, dense single coat that is long and water repellent. The fur may have a slight wave and is longer and feathered on the chest, the back of the legs, and the underbody and tail. The coat colors are shades of black, golden liver, or liver. The Field Spaniel may have tan points, and white markings, ticking, or roaning on the throat or chest. The mid-sized Field Spaniel has a solid, symmetrical build that conveys strength and grace. They are muscular and well-boned, and move with an agile, free-flowing stride. Fields are intelligent, with a serious, soulful expression in their brown eyes. Their feathered pendant ears are satiny and long enough to reach their nose. The Field's low-set tail may be docked or natural, with a preference for docked in the show ring. The Field Spaniel's ancestors hail from Spain, but the breed's distinguishing characteristics developed in England in the 1800s. Early Field Spaniels resulted from the crossbreeding of Cocker Spaniels, English Water Spaniels, and Sussex Spaniels. 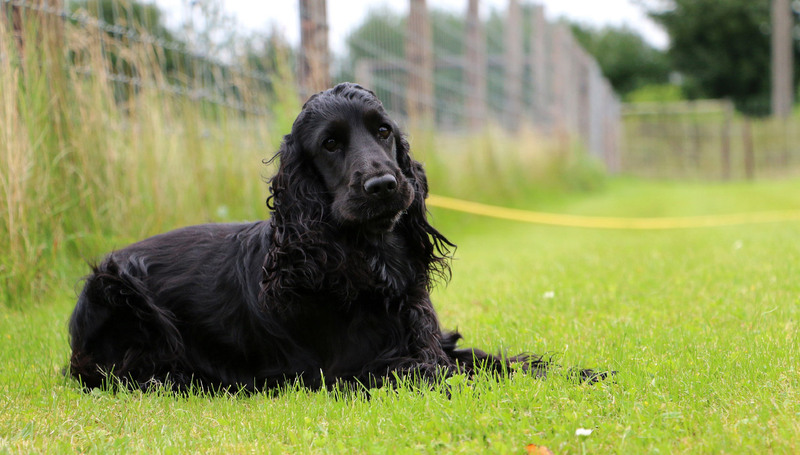 Breeders went on to tinker with the popular spaniel type and created a long, short breed that did well in the show ring, but had health problems and lacked hunting skills. When the show spaniel's popularity waned, the breed almost went extinct. The Field Spaniel was saved only by the efforts of a few breeders who returned the dog to its roots as an athletic and good-natured gun dog. The American Kennel Club recognized the breed in 1894. Field Spaniels are an even-tempered, intelligent breed beloved for their steady nature in the field and devotion to their families. They are curious and playful, and flourish when kept mentally and physically active. Fields can be somewhat shy with strangers, but will usually warm up in time. Socialize your Field from puppyhood so she is comfortable with new situations and people. Are Field Spaniels Good with Kids? At once gentle and frolicsome, Field Spaniels make excellent playmates for children. Fields will put up with a lot, so be sure children know dogs always deserve respectful treatment. Are Field Spaniels Good with Other Pets? Fields are sociable with other dogs when raised with them from puppyhood and socialized effectively. They are likely to categorize cats and small animals as prey. Fields are not intensely protective of themselves, their people, or their territory. Are Field Spaniels Good Guard Dogs? The Field Spaniel will bark to announce the approach of visitors. And though they are reserved with strangers, this won't translate to guarding behaviors in this gentle breed. Field Spaniels are high-energy dogs, but not hyperactive, and even possess a calm quality when at play. Indoor The gentle Field Spaniel thrives in the company of his family and should live indoors with them. As far as the fun-loving Field is concerned, playtime should always continue inside. House friendly games such as hide and seek, and puzzle toys are good options for keeping him busy. Fur cleanup is minimal because Fields shed lightly. But expect to find puddles around because Fields enjoy splashing, even if it's just in their water bowl. Outdoor Field Spaniels should spend much of their day outdoors getting the exercise they need to keep them healthy and happy. Be sure your yard is well secured because Fields will find small escape routes and set off after birds or squirrels. Exercise A healthy, adult Field Spaniel requires two to three hours of physical activity each day. Hunting is their favorite activity, but they excel in most dog sports and agility training. Endurance Stamina is at a surplus in Field Spaniels. Running Miles: This energetic breed will bound out of the house with you for a three- to four-mile jog. Hiking Miles: Fields can tag along on a half day hike with ease. Food Generally, Field Spaniels require about 1½ to 2 cups of good quality dry dog food each day, given in two feedings. This will vary, however, based upon your Field's activity level and age. Talk to your veterinarian about the optimal diet and quantity of food for your Field Spaniel. Alone Time Field Spaniels are highly attached to their humans and become distressed when left alone for even short stretches. They are prone to developing separation anxiety, as well as unwanted behaviors such as barking and chewing. It's ideal for a family member to stay with them around the clock, but you can leave your Field for an hour. Minimize the damage by leaving him in his dog crate with a favorite puzzle toy. The Field Spaniel's long, single coat requires brushing several times a week to keep it clean and free of matting and knots. She needs a bath is every few months, or when she's muddy or malodorous. Brush her teeth several times a week, and trim her nails every month or so to prevent painful cracking. Her floppy ears are prone to infection and require a weekly wash with a gentle, dog-friendly cleanser. You can minimize serious health concerns in your Field Spaniel by purchasing your dog from a reputable breeder who engages in responsible breeding practices, and through screening for common diseases and conditions. Though smart, Field Spaniels mature slowly, so training sessions require consistency and an abundance of patience. They are also sensitive sorts, meaning a gentle approach yields the best results. Fields are happiest when they are kept active and challenged. They excel in most dog sports, including agility training, flyball, and dock jumping. Though not one of the more well-known sporting dogs, the Field Spaniel's adaptable and steady hunting style is appreciated by hunters in the know. No. Field Spaniels shed and, as a result, release pet dander in your home. Dander is the primary cause of pet-related allergies. Are Field Spaniels good gun dogs? es. The hunting instinct was almost bred out of Fields in the 1800s when popular confirmation qualities were favored. However, careful breeding helped restore the Field to her hunting origins, and today she is known as a reliable, persistent gun dog. Field Spaniels love swimming and will jump into any body of water they pass if given the chance. Even dogs who are strong swimmers should be supervised closely when they are in or near the water.